Many years ago, the good folk of the village of Bowmore gathered together to drive the devil out oftheir church and off the island. The church, you may be aware, is round - therefore affording the devil nowhere to hide. They marched down the road and through the distillery and it is assumed that the devil made his escape in a cask heading to the mainland aboard the Maid of Islay. 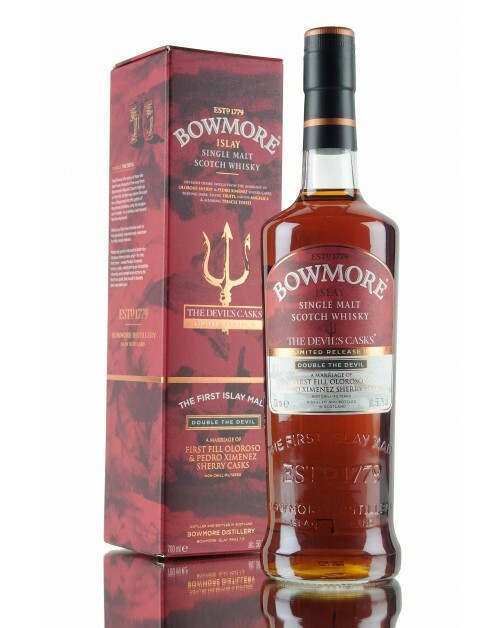 This is the third and sadly, final Devil's Casks release. It uses both Oloroso and Pedro Ximénez casks for the first time. Nose: Sultanas, salted caramel, melted chocolate and burnt orange peel. Palate: Sea salt and chocolate, rich dark fruits, light smoke and spice. Finish: Long with intricate coffee and red cherry tones.